Published in the South Kent Gazette, 16 April, 1980. Strond Street, which was much reduced in residential capacity by the advent of the railway in 1860, which caused the demolition of a good many houses, was still further reduced in 1929-30, by the Harbour Board quay widening scheme. 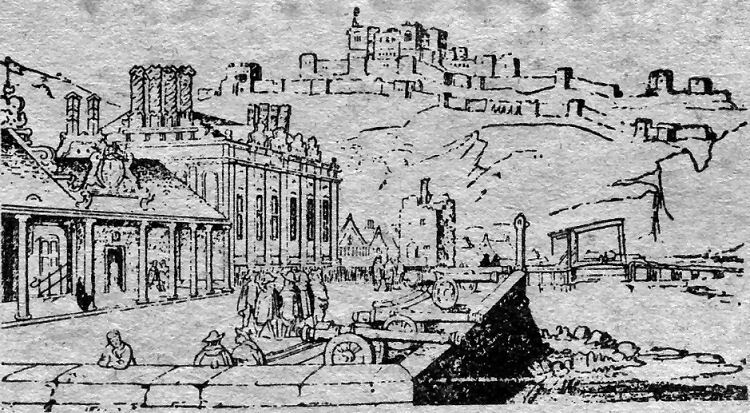 This removed not only the buildings in Snargate Street, but those which backed on to them on the quay side. Strond Street, prior to this, extended as far as the quay called Union Street, which is the approach to the Wellington Bridge. Facing this was the "Barley Mow“ public house, quite famous among sailors. The old thoroughfare, which is a mere access road now to warehouses fronting the Granville Dock has some historic associations. These used to be an open space at the top of Strond Street, which was, until about the year 1871, the Admiralty yard, and was in charge of the captain and the purser of the Dover Mail Packet service, who had residences there. This was before the mail service was put out to contractors about 1866. Before that, mail boat services were ran by the Admiralty and also by the French Government. At this yard the packets were repaired and there was a launching slope from the yard to the docking place of the present perpendicular dock wall, the alteration being carried out when the Granville Dock was created in its present form in 1871. The Southern Railway's Mail Packet office which stood nearby, on Custom House Quay, maintained this connection with the mail service until the mid 1930s. According to an official notice, dated 1842, any vessels of HM Packet Service having Royalty on board were Instructed to proceed to this Admiralty Yard Quay, so as to avoid the press of spectators when such distinguished visitors landed. Strond Street was an extremely busy thoroughfare. There were the Swan Hotel, Royal Mail Hotel, Starkey’s Temperance Hotel, the Ship Hotel (closed in 1914), Mechanics’ Arms (closed 1911), George Inn (closed 1909), Prince Imperial Hotel, Green Dragon and the Harp Hotel which stood next to Trinity Church. This hostelry was closed in the early part of the 20th century and used for a while as a school and then converted into fiats. There were also Henson’s dining rooms, the offices of Messrs W. and J. Bushell and the Dover hoy, the Friendly Societies’ Convalescent Home, Messrs Hammond and Co.’s shipping agency, (including the offices of Mr W. Grant and Mr Ernest A, Marsh, vice-consuls, Mr Hambrook’s pharmacy, a very old established Pier institution, offices of Messrs Prescott and Co., (shipping and Consular agents) and the old Harbour Station, part of which still survives on the other side of the railway. 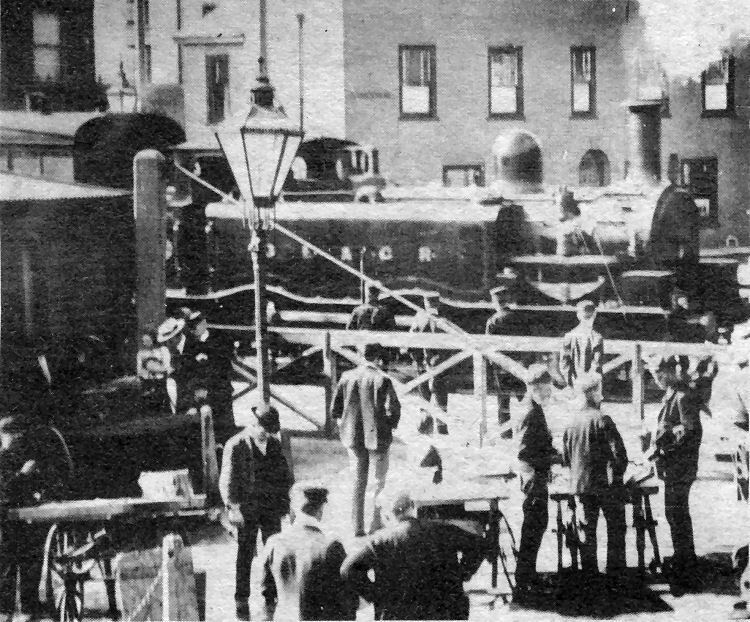 A number of houses were pulled down to make room for the railway before 1860 and more followed in the early 1870s to enlarge the Granville Dock quay. Later still shops, warehouses and the Pavilion and Gun Inns were demolished on the west side, near the Crosswall, for widening purposes in connection with the laying down of tram lines for Dover Corporation Tramways. A tank engine of the old South Eastern and Chatham Railway steams over a level crossing in the Strond Street area about 50 years ago. In the foreground is the old fishmarket. 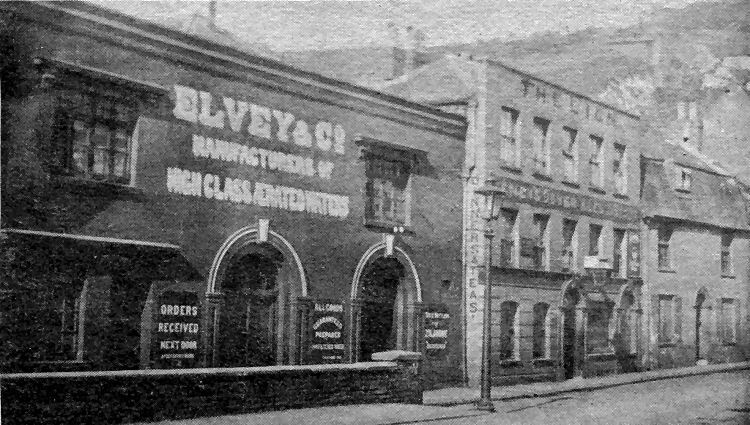 Above picture the Custom House, near New Bridge, In the time of Queen Elizabeth I.
Elvey’s mineral works, formerly a Wesleyan Methodist chapel, and The Lion public house, In Elizabeth Street about 1912.